No business or brand can afford to not be listed on the first page of search results. That is the simple fact. Submitting to directory websites is one of the best ways to increase local visibility; however, businesses must be listed not just on every directory site, but on the best sites. Our directory submission service does just that and more. To explain more about what directory submissions do for businesses and brands, we have created an easy to understand infographic, Top 50 Directory Package In A Nutshell. In this post, we break down the infographic and explain exactly how using our submission services increases local visibility, generates more search traffic, and fills the sales pipeline. With the number of directories on the Internet constantly growing, businesses need to be sure that their information is submitted to those that have the most authority. At Advice Local, we only submit business listings to directories that meet our strict qualifications, which are determined by 23 different metrics, including domain authority and page rank. 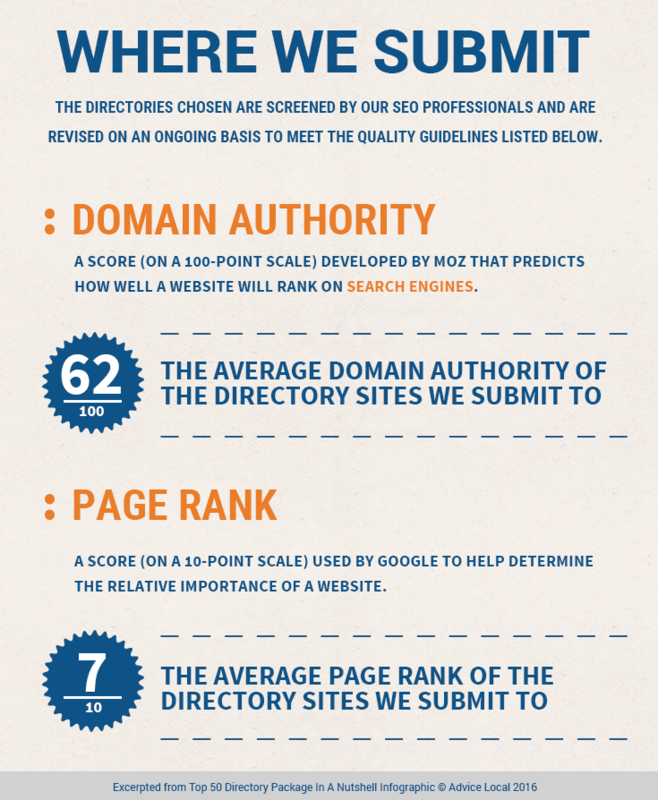 Domain Authority is based on a website’s score using Moz’s 100 point scale. Advice Local uses directories that have a domain authority, on average, of 62. Page Rank is based on a 10 point scale which determines the importance of a website. We use sites that rank, on average, a 7 out of 10 on Google’s scale. A sampling of the directory sites we are currently submitting to include Superpages, Yellow Pages, and Angie’s List. Keep in mind that this list is monitored continually and if one of the 23 metrics that we use as qualifiers changes, then we review the directory site. As shown below, at the time this data was collected Advice Local had over 3 million visitors to their citation sources through organic search. Imagine what that means for a local business’s online visibility. 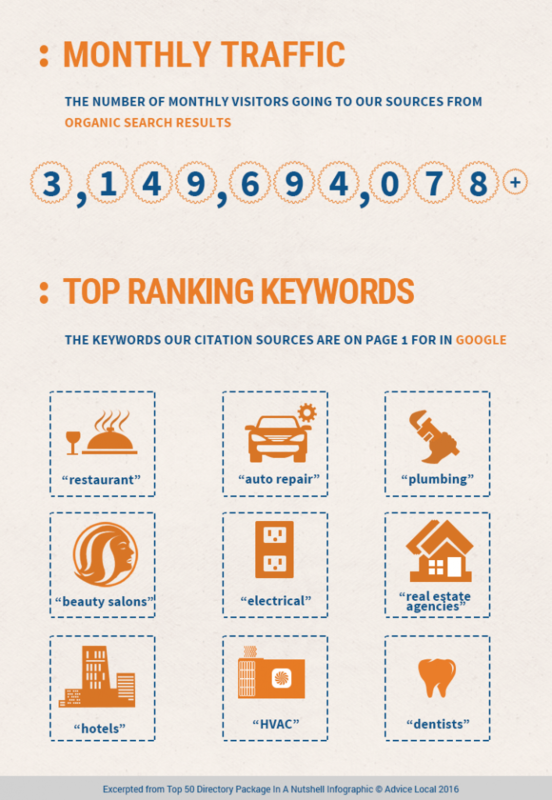 The citation sources of these businesses are on page 1 of Google in keyword searches for a number of major industries including: plumbing, auto repair, hotels, restaurants and more. When a business signs up for Advice Local, they can expect an increase in local visibility from between 35% to 85% (data based on a sampling of over 3 million submissions through Advice Local). As you can see, when businesses take this important step they create a cycle of ever increasing local visibility, more search traffic, leads, and sales. Run a free online visibility report right now. After we submit a business’s data to the top ranking directory sites, our Local Safeguard™ monitoring service continues to manage and maintain their local visibility. 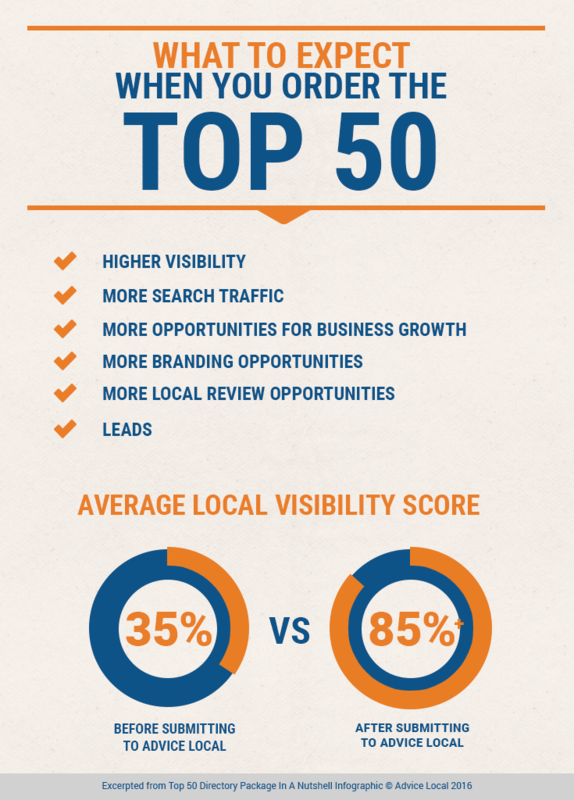 Is your business struggling with its local visibility? Is your business not getting website traffic? Is your business not showing up on the first page in a keyword search? 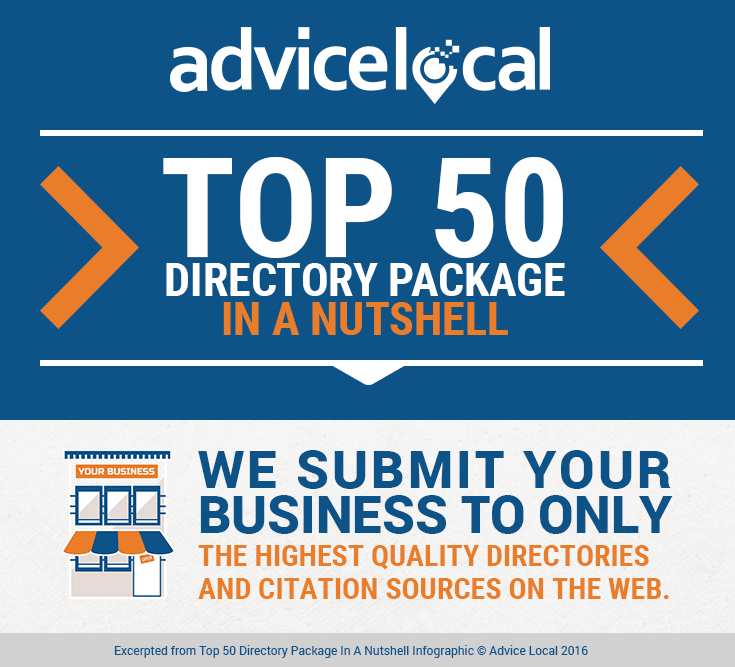 Advice Local’s Top 50 Directory Package is the answer! Call us TODAY to get started (855) 714-7634. Interested in becoming a Advice Local Reseller? Request a demo today.